Light glints off the blue and silver pinwheels as they spin in the breeze in front of the Susquehanna County Courthouse. 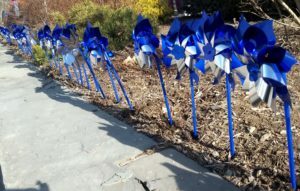 There are 160 pinwheels – each one represents an alleged case of child sexual abuse brought to the Children’s Center of Susquehanna and Wyoming Counties in 2018. April is Child Abuse Prevention Month, and was recognized by proclamation in the county at the commissioners’ meeting last week. Susquehanna County CYS Director Michele Graziano reported that the department received about 750 general referrals and 160 child abuse referrals. “That is a total of over 900 reports that were reviewed and investigated in 2018,” Graziano said. The total includes reported of neglect, child sexual abuse, physical abuse and mental abuse. “Our community has made over 900 reports of suspected child abuse to this agency or Childline,” Graziano explained at the meeting. Graziano said the county has a strong team of professionals working together to ensure the safety of children, including law enforcement, the sheriff’s department, district attorney’s office, local mental health providers, medical providers, drug and alcohol treatment providers, as well as her department and the Child Advocacy Center. 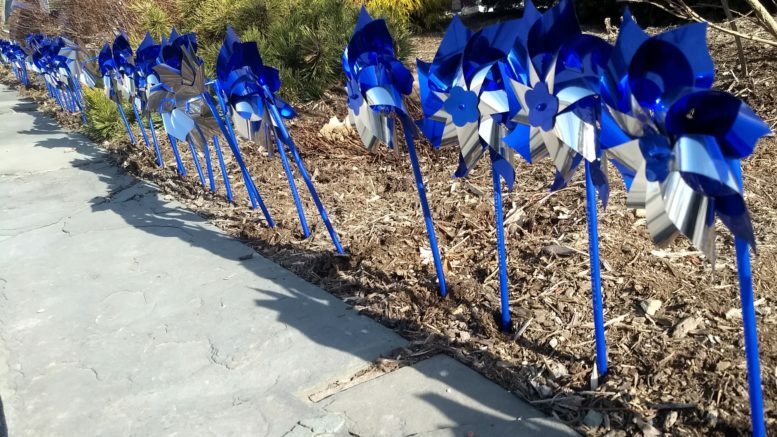 The pinwheels placed in front of the courthouse were donated by The Children’s Center of Susquehanna and Wyoming Counties and represent a child that was identified as an alleged victim of sexual abuse last year. Children’s Center program director Janine Fortney said the center, located on Ellsworth Drive in Bridgewater Twp, has been open for four years. She, too, noted the positive environment in the county working with law enforcement and the Women’s Resource Center. Commissioner Alan Hall offered appreciation on behalf of the commissioners to the agencies that advocate on behalf of children in the county. “I know some days are tough,” he said. Be the first to comment on "Pinwheels reflect child abuse cases"